Symphonic Power Metal band VISIONS OF ATLANTIS has had a multitude of line-up changes over the years. They have never recorded a record where the band members have been consistent from one record to the next. This tradition continues as they unleash their latest record “Ethera” through Austria’s Napalm Records. Early on their style was drenched in symphonic power metal and was similar in style to NIGHTWISH. Over the years they seem to be moving away from that style and incorporating more of a modern Rock vibe and closer in style to later day LACUNA COIL. Starting with 2011s excellent release “Delta”, the band seemed to shift styles. While keeping the symphonic elements the Power Metal feel has been left behind and their song writing is better for it. What was begun on that record has now been perfected on their amazing new release “Ethera”. Vocalists Mario Plank and Maxi Nil is the perfect combination as the two play off each other brilliantly. Both singers are excellent in their own right but together they bring out the best in each other. Every song has both of them incorporating infectious melodies and harmonies; they never fight for space as their parts are divided up flawlessly. Unlike other bands that have a female and male vocal team, both singers are equally up to the task and don’t clearly outshine the other. Opener “The Ark” slams out of the gate with a haunting keyboard melody that is backed by a syncopated groove riff that will have you banging your head. Maxi’s chorus melody is one of the brightest on the record. It is captivating and gorgeous. I am so glad she doesn’t utilize the opera style vocals as her voice is powerful and crushes. The song is punctuated by an arpeggiated guitar solo that new guitarist Chris Tian executes beautifully. “Vicious Circle” showcases Mario in the intro at his most tender as he is backed by a picturesque piano piece. Maxi joins in unison as a mid paced chorus kicks in that is tremendous. Another excellent guitar solo builds the song to a tremendous outro as Maxi lets loose and shows off her amazing range. Drummer Thomas Caser shines on the slamming “Hypnotized”. A driving melodic masterpiece this is the highlight of the record and maybe of their career. This track is the accumulation of what VISIONS OF ATLANTIS can accomplish with their current line-up. A gorgeous bridge section is followed by more excellent guitar soloing and finds the two vocalists utilizing their skills to their limit. Breathtaking. 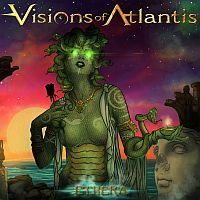 "Ethera" finds VISIONS OF ATLANTIS at their best. What began on their last record has been solidified and perfected here. Front to back this is the best release of their career. Let's hope they break the streak of replacing members and we see the band continue on with this line-up. The band is at their creative peak and should garner a lot of attention with this release. Another excellent Symphonic Metal release that should stand out on the strengths of the two vocalists whom are both at the top of their genre.